The Beach at Bude is located right on the Summerleaze beach, ideal for romantic seaside strolls and wave-watching. 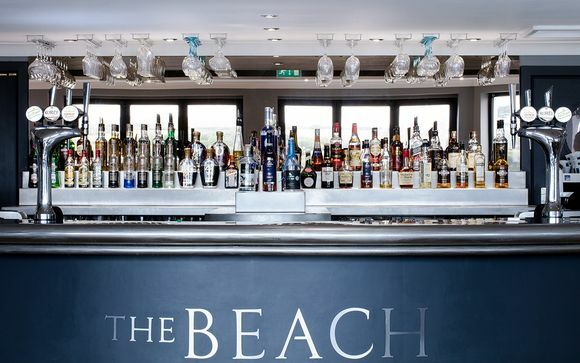 Serving up a whole host of exciting cocktails; the beach bar at this hotel is a welcoming place to sit on the sun terrace overlooking the beach. Our members will enjoy indulgent fine dining at The Beach Restaurant and a decadent Afternoon Tea for two (T&Cs apply)! 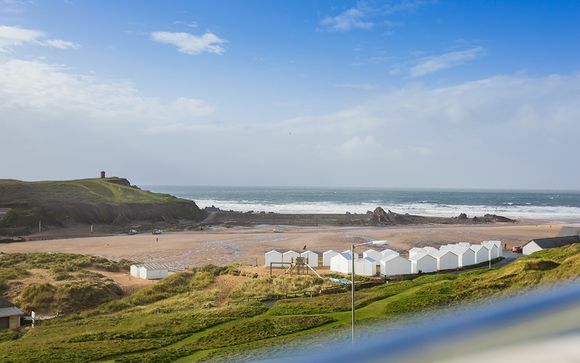 Appearing on the Marine Conservation Society's Good Beach Guide for the exceptional quality of its water, the stunning Summerleaze Beach offers a beautiful backdrop to your stay at The Beach at Bude. Bude itself is filled with offbeat cafes and shops and boasts endless untouched countryside waiting to be explored. Rent a bike and discover the coastal pathways, go horse riding on the downs, or try your hand at a game of golf. If the weather permits, Bude is especially known for being ideal for surfing. Brave the waves and book a lesson to learn how to surf or, for those searching for something a touch more relaxing, go on a fishing trip at the Bude Harbour. A charming Victorian building, this beachfront hotel is decorated in New England style. It blends fine dining and refined interiors with a laid-back beach bar vibe to strike the perfect balance between elegant and casual. 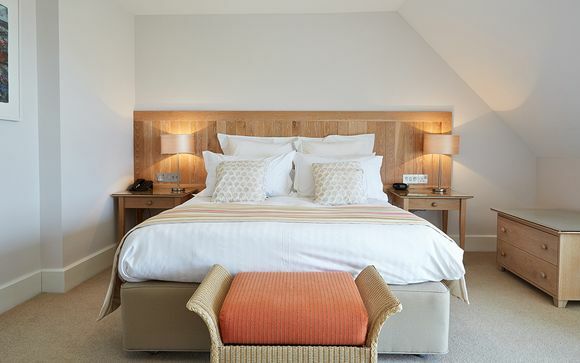 Holding recognition from The Good Hotel Guide, The Michelin Guide and The Sawdays Collection, the hotel is a fine choice for a hedonistic Cornish getaway. This offer is based on a Classic Room or a Superior Room. Your Classic Room is equipped with all the amenities you need to feel comfortable during your stay. Airy and bright, this is a great space to return to at the end of a beach day. 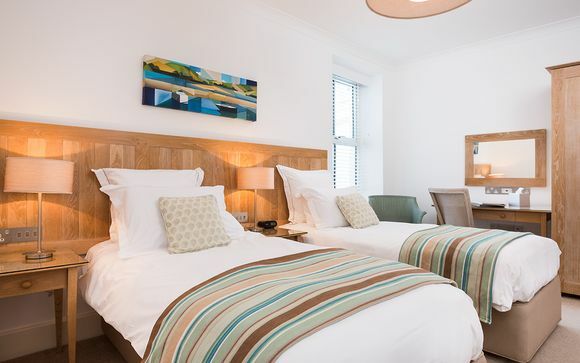 The gorgeous Superior rooms all have Juliet balconies and stunning sea views. They all have King or Super King-size Vi-Spring beds, cosy Lloyd Loom chairs and either walk-in showers or baths with an overhead shower. Enjoy a fine dining experience each evening during your stay at The Beach at Bude. At the helm of the kitchen is Joe Simmonds, who previously trained under Sam Moody at Michelin-starred restaurant The Priory. 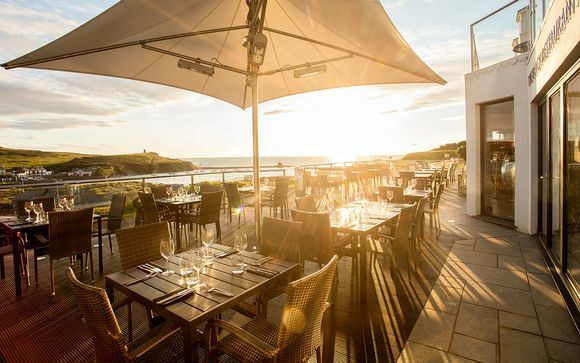 Encouraged by his passion for menus that incorporate fresh local ingredients, the food at The Beach Restaurant includes Mooreland steak, freshly caught hake and stone bass, and perfectly seasoned accompanying vegetables. End your meal with one of the artistic desserts for a sweet finishing touch.